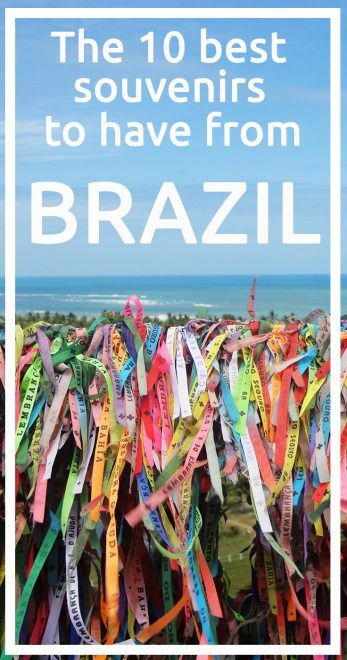 After sharing with you 20 traditional things you must do in Brazil a while back, many readers have asked me what’s interesting or what are the most popular souvenirs to bring from Brazil. Of course, the best souvenirs you can take back home with you are the memories you made and the pictures you took, but if are looking for more, then you will find ideas below. 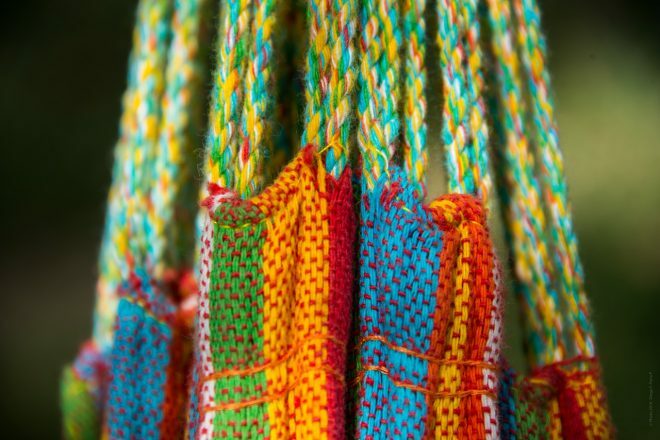 If back in your house you have the chance to use a hammock, don’t hesitate to get one, it is one of the coolest and useful souvenirs you can have from Brazil. They can be found in many colors and styles, the best ones are handmade and you can get them at the local markets, especially in cities of the Northeast region. 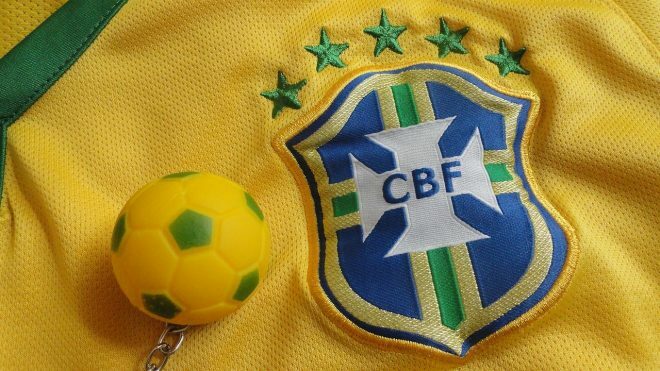 Even many Brazilians have this one at home after a visit to Rio de Janeiro, where they can be found in many sizes and made with different materials, varying from glass to wood. You can buy them not only at the famous landmark, but in many other places in the city, which sell souvenirs. These wristbands were created way back in 1809 and have a very interesting story. 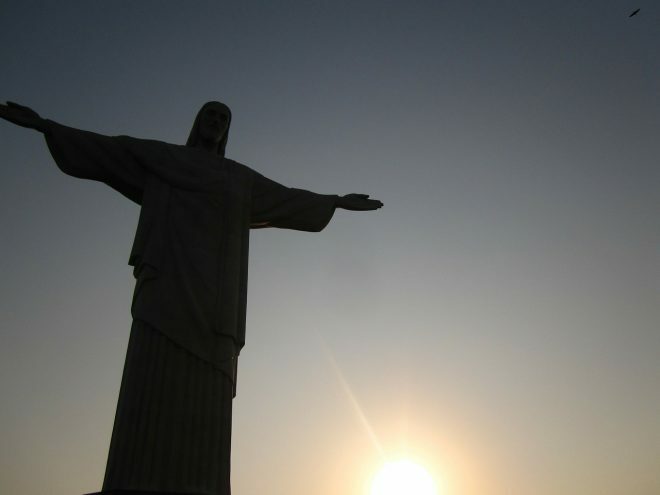 They are 47cm long, the exact measurement of the Jesus Christ’s statue found in the most famous church of Bahia, the church of Nosso Senhor do Bonfim in Salvador. Early on it was used on the neck, as a necklace, but in the 60’s it was already common to wear on the wrists. 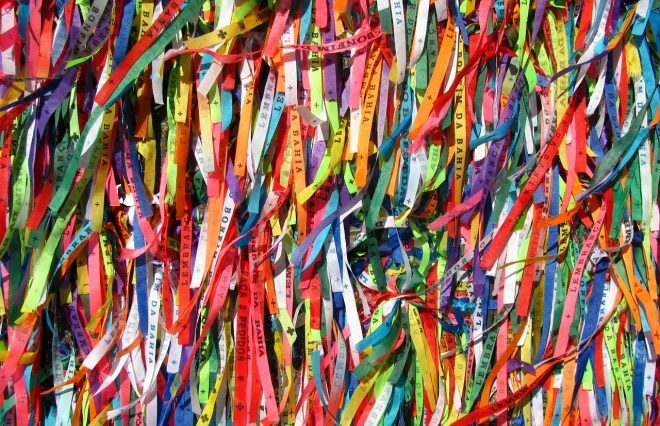 The cotton wristbands have the phrase “Lembrança do Senhor do Bonfim – Bahia” written on them, which means “souvenir of Senhor do Bonfim – Bahia”, and should be wrapped twice around the wrist and tied with 3 knots. To each knot you should make a wish to be kept in secret, which will be accomplished by the time the band breaks naturally. They are found in different colors, and each one represents a different Orisha (African ancestral). 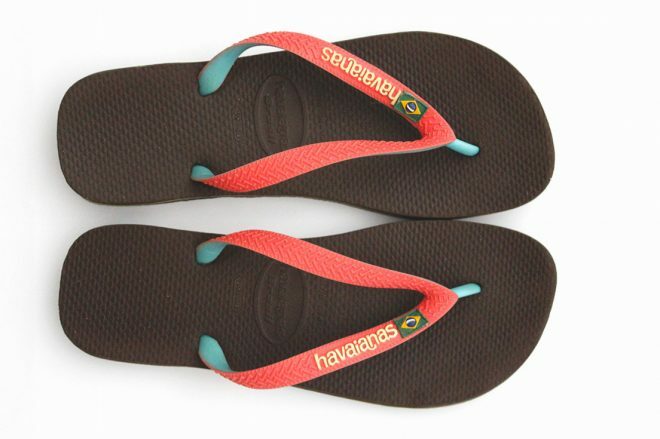 Brazil is home of the well-known Havaianas, the most famous flip flops brand in the world. As you may imagine, buying them in Brazil is cheaper than anywhere else, and these are one of the best souvenirs you can have from the country. Apart from Havaianas, there is also its biggest competitor, Ipanema. They are found in several colors and shapes, and often have special editions and different themes. I must confess that every time I visit my country I bring at least one new pair for me. For the girls, a bikini, for the guys, a sunga. Brazil is one of the most famous countries for beachwear, especially when it comes to bikini, very associated with the country. As a Brazilian living abroad and who have traveled to many other countries, I can say that to me there is no bikini like the ones from my home country. Why not get one as a souvenir? In fact, you can already put it into use right there! 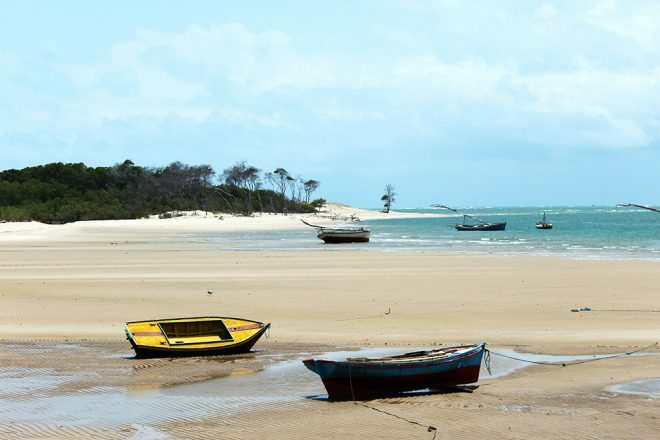 Also very famous among Brazilians, though not as a souvenir, but for personal use on the beach. Sarong, or canga, are found in different colors and prints, and can be bought in beachwear stores, as well as on the beach and local markets. These are traditional from the Northeast region of the country and are normally used with a swimsuit or for laying on the beach sand. Why not? It’s not because we lost 7×1 against Germany at home that getting our official jersey is a bad idea. After all, we still are number 1 in the world, the only national team with 5 stars! Imagine having a beautiful image of Brazil in your home and at the same time help the local artists? There are beautiful paintings being made and sold everyday, not only in galleries, but also on the beach and markets. The only problem is choosing one. The typical Brazilian drink used to make caipirinha, cachaça is a great souvenir. At any supermarket you will find different brands, special editions and even special packaging sold with different prices, from cheap to very expensive. The most popular brands are Pitú, Ypióca, Sagatiba and Colonial, however, if you are looking for the best, here they are. 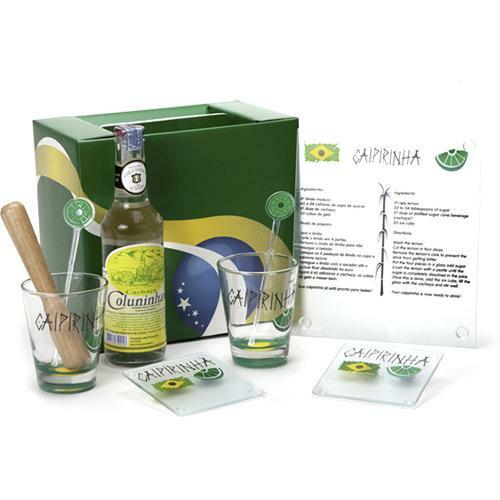 For the big fans of the drink, know that you can get a caipirinha kit to reproduce the drink back home, not that you really need one, but why not? 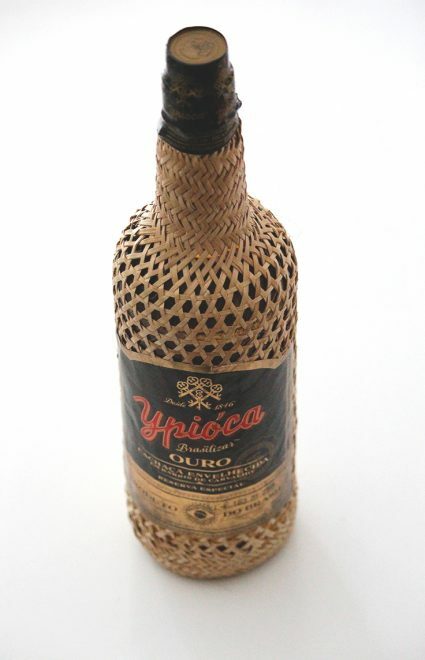 It’s a cool and original souvenir from the country where caipirinha was invented. Cheers! Aow great list! I got a wristband once too, when a friend visited Brazil. We did the ritual as well. Such a fun list! I’d happily buy all these to bring home (with the exception of the football shirt!) but I particularly love the idea of the wristband and making the wishes. I will take the hammock and the bikini please. And then wrap myself in a sarong head to toe! Aaaah dammit, I didn’t buy any of these but wish I had got one of those gorgeous colourful sarongs and had no idea Havaianas were from there otherwise would definitely have grabbed myself a couple of pairs of those! And yess, Havaianas are from Brazil, and are way cheaper if you buy them there, here in Europe they are too expensive in comparison! hahaha really? That’s so cool! I’m always wearing Havaianas at home, even during winter hahaha crazy I know! Ohhh I scarf with the Copacabana sounds awesome, I’d love one, I’ve never seen! Funny thing is, every time I visit Brazil I also bring something, cachaça, bikini, Havaianas or something like that! haha yes, hammocks are the best! Thank you Ahila 😀 I hope you do! Thank you Megan 😀 Yesss, both are a must!